Are you tired of having to frequently vacuum dirt and skim leaves and debris from your pool? Is the time you spend enjoying your outdoor space often cut short by pesky mosquitoes, no-see-ums , and intense sun? If so Porch Outfitters has a solution. We build custom pool enclosures that allow our customers to make the most of their outdoor space and enjoy their pools without having to deal with any of the drawbacks. Rather than offer cookie-cutter enclosures like many other companies, Porch Outfitters can build screen rooms in custom sizes and configurations to meet homeowners’ specific needs. We use only the finest materials in construction to ensure long-lasting beauty and performance. For example, we use specialty screening that is made from vinyl-coated fiberglass that will hold up to the harsh elements year after year. These screens also have a density of 20 strands by 20 strands per square inch, so even the tiniest pests are kept away. At Porch Outfitters, we don’t use subcontractors, but rather our own team of extensively trained and highly experienced technicians. To ensure each project is completed with the utmost precision and care, we adhere to the strict building standards set forth by the Aluminum Association of Florida. Our commitment to providing exceptional products and installations allows us to provide a lifetime warranty. 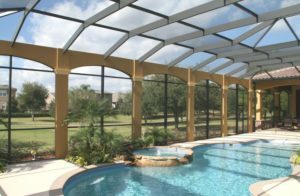 Learn more about the pool enclosures that Porch Outfitters installs and how having one installed can enhance your home in Hilton Head, SC. Contact us today.